Denise Rolark-Barnes and Dorothy Leavell are contending for chair of NNPA this week. TriceEdneyWire.com — As civil rights and racial justice enthusiasts observe the 190th birthday of the Black press, the premier federation of Black-owned newspapers is holding its first leadership election in which publishers are permitted to vote absentee this week. During its 2017 Annual convention at the posh Gaylord National Resort & Convention Center June 20-24, the National Newspaper Publishers Association (NNPA) is allowing each of their more than 200 member publishers to vote absentee for their preferred chairperson, NNPA’s highest office. Publishers expressed their ballots to the convention by deadline June 19. In past years, qualified publishers have had to attend the convention in order to vote. Largely facing the economic realities of 2017, the now 77-year-old association apparently recognized the inability of some publishers to travel to the National Harbor in Oxon Hill, Md. for the convention. It will feature the election on Friday as well as a string of social, educational, and issue-oriented events all week. The prestige of the two iconic candidates, incumbent Chairwoman Denise Rolark-Barnes, publisher of the Washington Informer, and Black Press stalwart Dorothy Leavell, publisher of the Chicago Crusader and Gary Crusader newspapers, appear to underscore the significance of the Black press in 2017. Black press enthusiasts say their candidacies also bode well for the strength of Black press perseverance nearing the end of its second century. “You’ve got two candidates who’ve got such successful and productive records in the Black press, who are willing to take and run that organization. This is an excellent sign that it’s in good shape,” says A. Peter Bailey, who teaches The History of the Black Press at the University of the District of Columbia and taught the same course for five semesters at Virginia Commonwealth University. Several factors, including the direction of the organization’s digital growth and journalistic focus make this year’s election especially important. Adding to the interest is the fact that the election is a rematch of sorts. Rolark-Barnes prevailed over Leavell by only six votes in the last election two years ago. 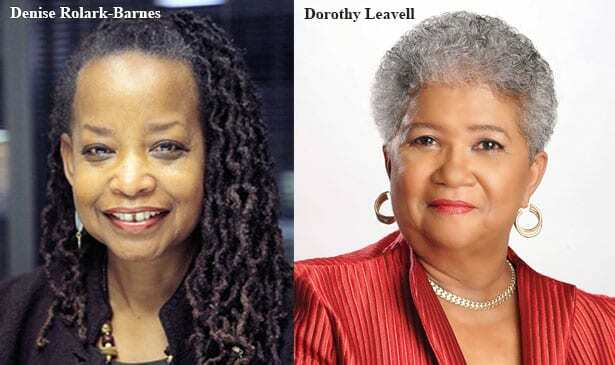 Both women are NNPA veterans with stellar reputations of commitment to the Black press. But Barnes and Leavell are also known for their distinctly different personalities. Leavell, known for her fiery speeches and fighting spirit, is a National Association of Black Journalist Hall of Fame inductee, who has held a number of NNPA leadership positions, including president during the late 1990s. In her campaign, she promises to fight for government and corporate advertising and to strengthen the NNPA News Wire, which in recent years has been moved from under the NNPA Foundation, a 501c3 non-profit, to the association, which is a 501c6 tax-paying trade organization. Leavell says she has sent a letter directly to the publishers outlining her vision and agenda. Rolark-Barnes has posted a video message to the organization’s members, outlining the successes and goals of her administration. The dueling qualifications of Leavell and Rolark-Barnes are well-documented. Both of their award-winning newspapers are more than 50 years old and the legacies and achievements of both women are featured in The HistoryMakers, an online oral history collection of distinguished African-Americans, now featured in the Library of Congress. Black press historian Dr. Clint Wilson, author of two books, A History of the Black Press and Whither the Black Press, agrees with A. Peter Bailey that the candidacies of Rolark-Barnes and Leavell not only bode well for NNPA, but for the institution of the Black press overall. Wilson also noted progress in the fact that an institution started by two men now has two women contending for leadership. He was speaking of John Brown Russwurm and Samuel Eli Cornish, who together founded the first Black newspaper, Freedom’s Journal on March 16, 1827.